This boutique hotel in the heart of Florence is definitely the destination you are looking for. We are proud to declare our boutique hotel as one of the most romantic locations in the city centre, are you curious to discover why? Part of the rooms of this luxury structure belonged between 1847 and 1861 to the two poets Elizabeth Barrett and Robert Browning, who escaped from London and the “Victorian” England, to secretly marry here, in Florence, where they also had a son, Pen. Elizabeth's father was against their marriage and for this reason they abandoned their land to get a refuge and an alcove in a city that was inhabited by many foreign residents, probably thanks to its reputation of being “cheerful and free”. Right in front of our entrance, inside the same building, you will find the museum dedicated to the two poets, rebuilt from 1971 (it can be visited by reservation) and now owned by the College of Eton, which has been involved in acquisition and relocation of original pieces. Elizabeth wrote here her most beautiful works, while the life of the couple was also told in a famous novel by Virginia Woolf, Flush, a dog's life, published in 1933. From her window, the poet watched the people and life flowing along the streets of Florence. She also described with strong passion the “Risorgimento” movement (fighting for the independence of Italy) and the figure of Camillo Benso Conte di Cavour, a very important Italian politician she really appreciated. Make your dream come true and book now your room inside the most evocating boutique hotel, Florence has always been the shelter of lovers, the “Capital” of the balanced, sensual and relaxing life, the homeland of “the good and the beautiful”. 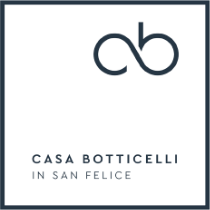 Casa Botticelli, the art of hospitality, emotions’ gallery.